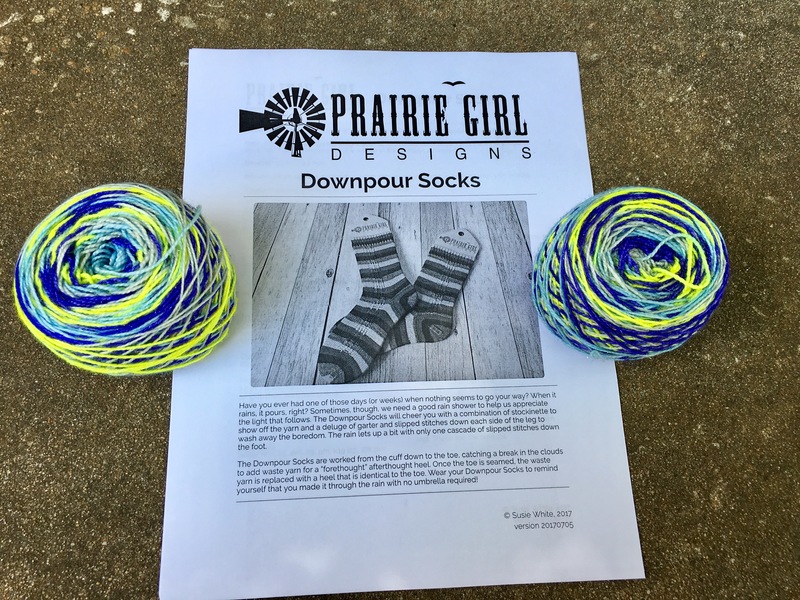 I prepped my Downpour Socks awhile back. Well, I finally cast them on during my Colorado vacation. I managed to get both cuffs done in between family outings. I tried to manage the yarn so they would match. I am close but not quite on the money. But it’s totally close enough for me! I put these aside until I can carve out a few minutes of alone time to count and get both set up rows down and marked. Toddlers/husbands plus counting don’t really go well together! I created these using a basic toe-up vanilla sock over 72 stitches. My Ravelry notes are here. I only needed roughly 70% of the skein or 327 yards of yarn. 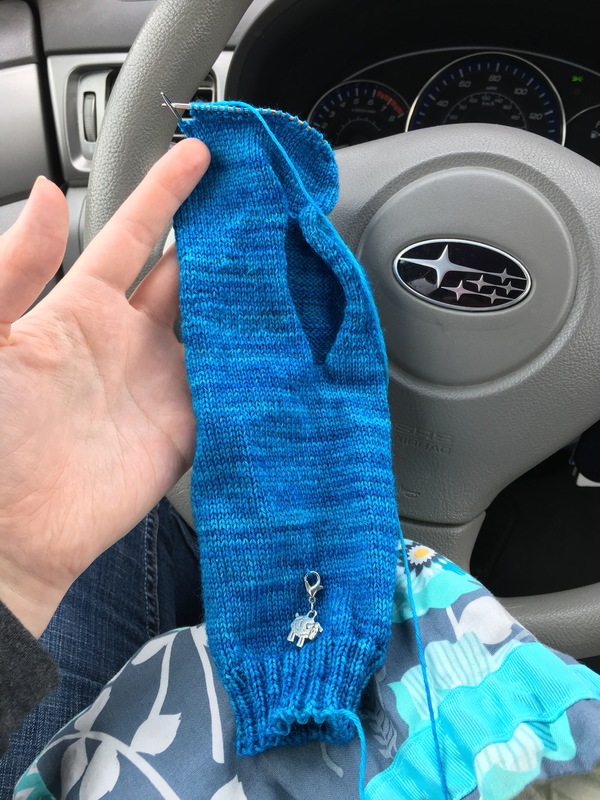 I basically eyeballed the second sock instead of measuring the first. This may have led to an error. 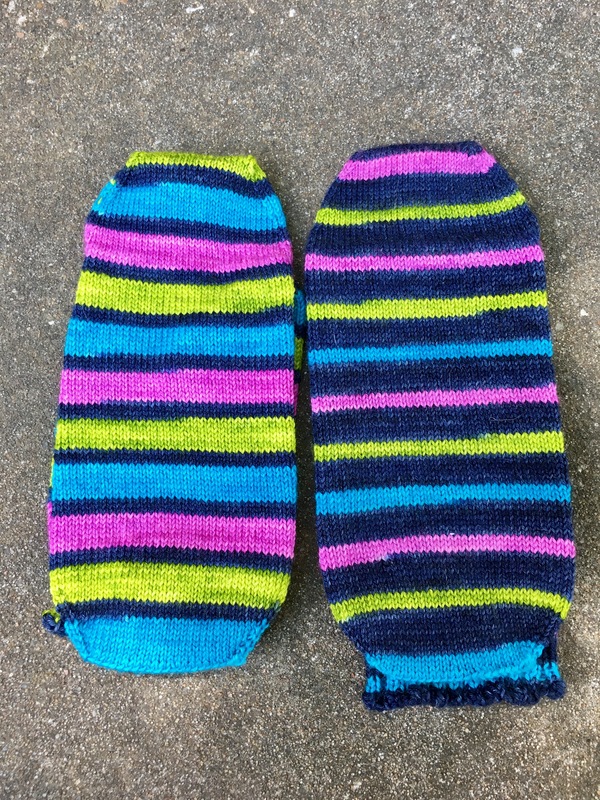 The second sock with the wider color stripes is a smidge shorter in the leg than the first. I was just so excited to finish them and stop at a navy section that they came up short. Shhhh, don’t tell the knitting police on me! 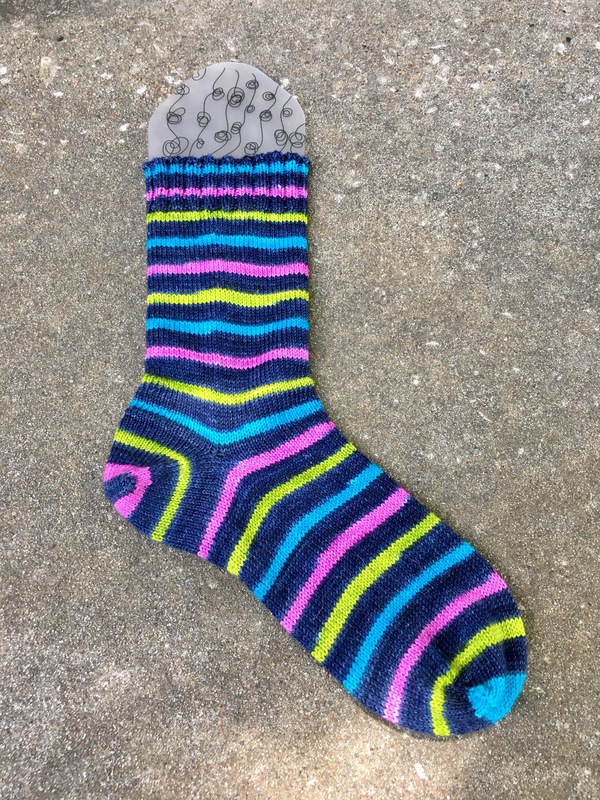 The first sock I knit was with the skinny stripes of color. I was very pleased with my color management on the heel. 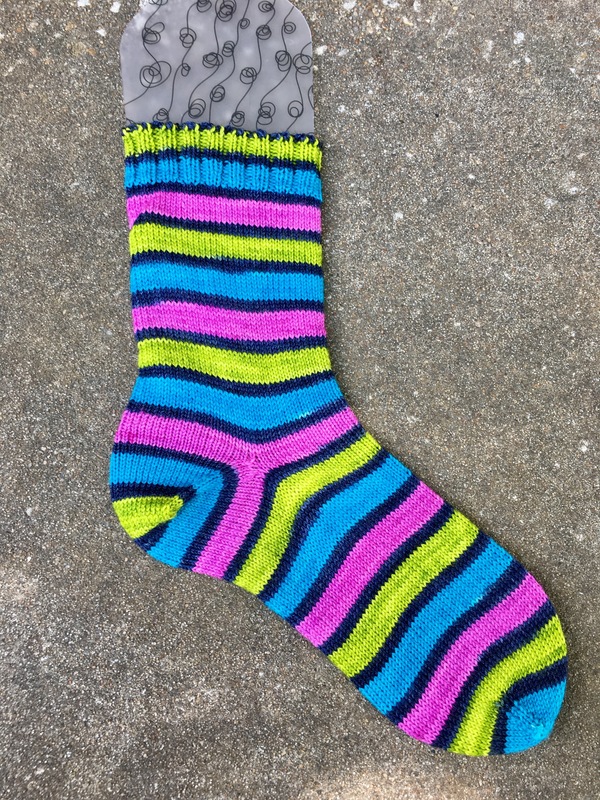 Then the second sock….boy do I love these larger stripes even more! They are just so bright and neon, what’s not to love? And again I was very happy with how I was able to insert the afterthought heel and maintain the color progression. Both socks have been safely tucked away in the cedar chest for next fall! While toodling around Colorado Springs with my mom I found Ewe and Me a delightful shop full of color. Guys, this place was YARN HEAVEN. They had a larger store with a fantastic selection of yarn, two adorable shop dogs, and just two of the nicest owners you can hope for. I was totally high on yarn fumes. I was fairly restrained though. 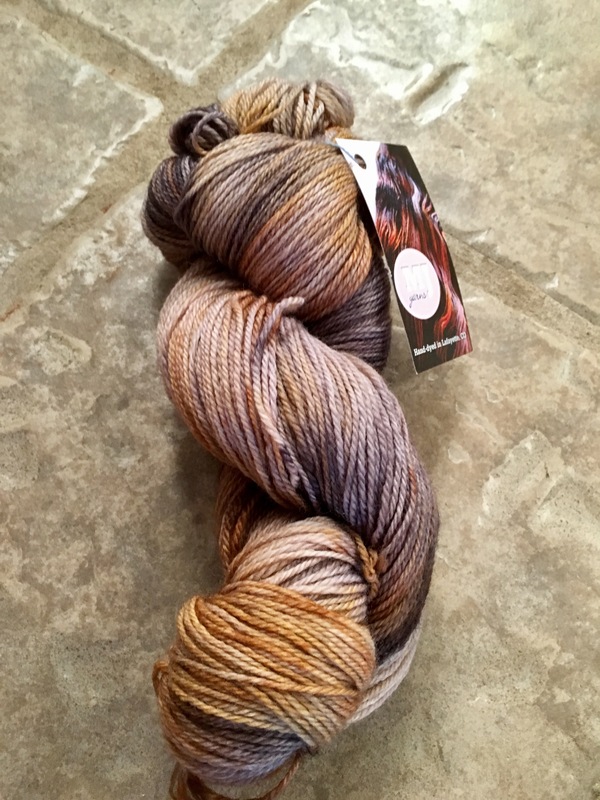 I found another unique local dyer in Andromeda Yarn. As far as I can tell they only have an instagram account. But oh my I fell hard for this speckled delight! The color is called Settle My Nerves. I even had the shop owner wind it right then and there. And I cast on some vanilla socks that night for movie theater knitting. The hubby took me to Despicable Me 3. I am so in love with the speckle trend! I also picked up some work horse yarn for a pair of socks for my sister. 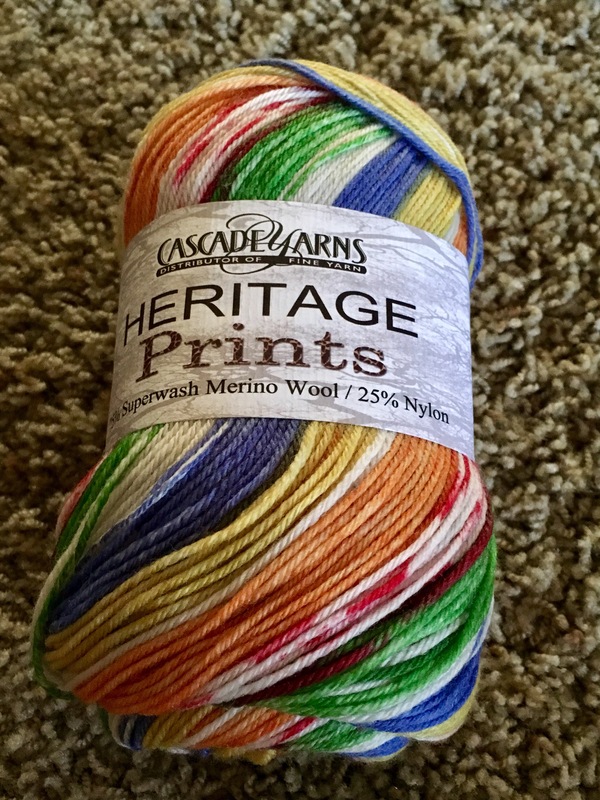 It’s the Rainbow color in the Cascade Heritage Prints line. This stop was so delightful I will make sure to get back here whenever I’m out in the Springs! While I was exploring yarn shops my mom tagged along and I took her to quilt shops in and around Colorado Springs. 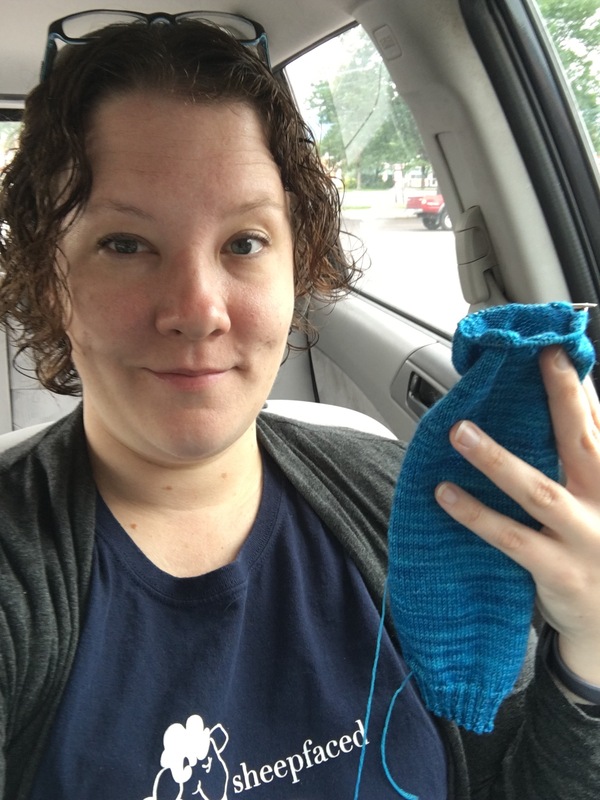 Quilts aren’t my bag so I waited in the car and jammed out to podcasts and worked on my TrueBlue mitts. The Hubby, Jellybean, I and the grandparents recently loaded up and headed to Woodland Park CO to visit my sister. It was an action packed trip of lots of crying in the car, baked goods, deer everywhere, mountain climbing and amusement park rides. But somewhere in between I managed to sneak in a few yarn shops. I’m going to show you my haul over the next couple of days! My first shop was Nikki’s Knots right down the road from my sister in Woodland Park. The shop was cozy and well organized and the owner was knowledgeable and very friendly! 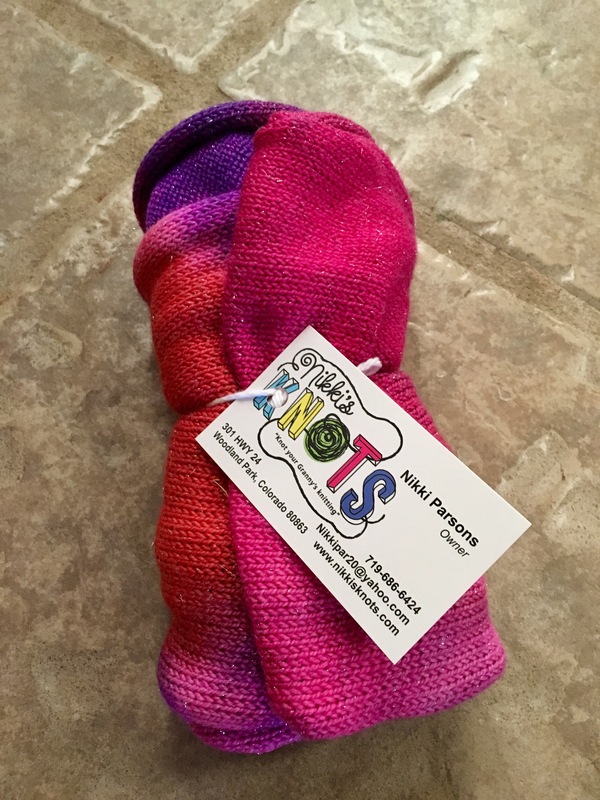 I managed to snag two items from Colorado dyers. First was a skein of Simple Sock from MJ Yarns in the color “Mice and Men”. This is telling me it might want to be a scarf and mitts or maybe a shawl. Next was a sock blank made by Nikki herself. It’s pink and purple craziness that’s 75% merino, 20% nylon and 5% stellina. This blank was a special color for the 2017 Yarn Along the Rockies yarn crawl. Not only did she have these out early but she gave me the free shop pattern for the shawl she designed for the crawl. I will MOST definitely visit her again. I had the most delightful time! My husband and I have been taking turns in the garden this summer. Okay, to be fair he’s done most of the work because Jellybean has been in a “mommy only” phase that has absorbed most of my time. But this morning I snuck out before Jellybean woke up and picked these beauties. We planted basil, tomatoes, jalapenos, green bell pepper, cherry tomatoes and onions. All but the onions are thriving! 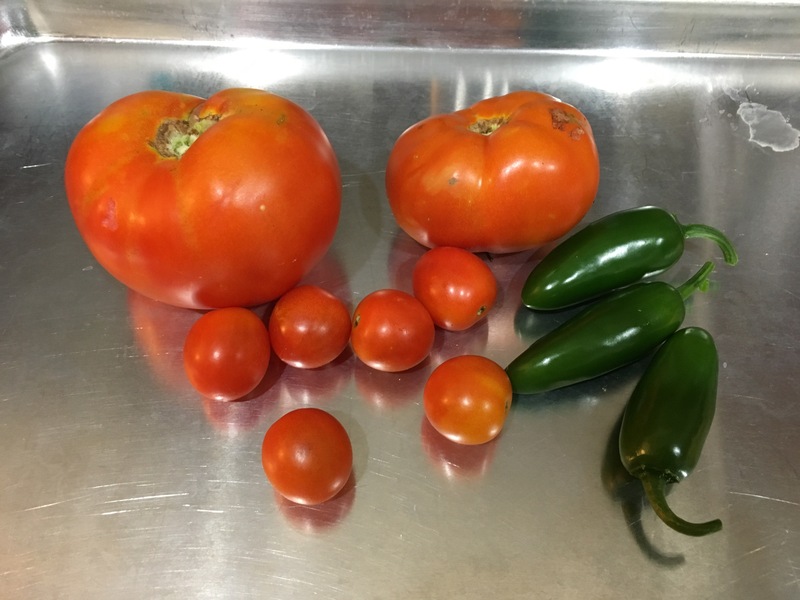 I believe we will either have BLTs or fresh chunky garden salsa for supper tonight! My Terribly Simple is blocked and dry. I am beyond thrilled! 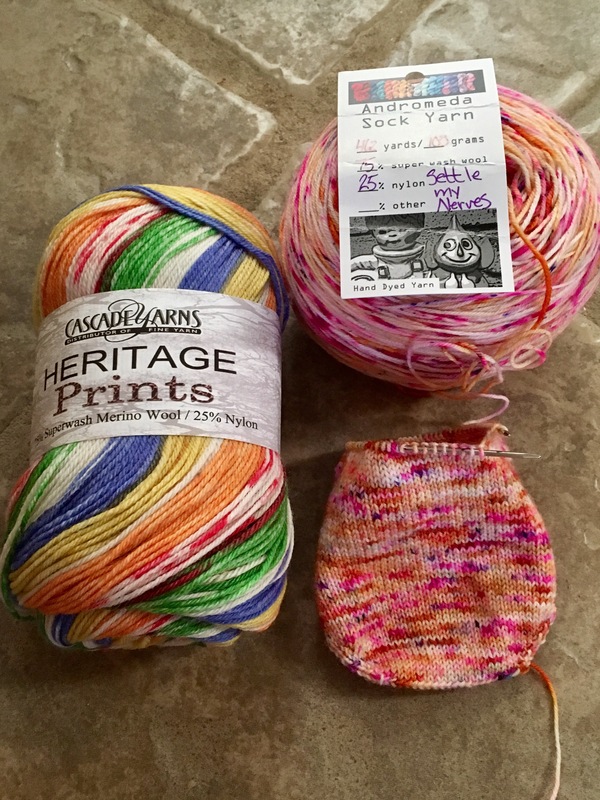 Yarn: Hansen Hand Dyes Mega Merino for contrast color and T&H Fiber Works Heathers Favorite Sock for the main color. I used 74 yards of CC and 328 yards of MC. I was extremely pleased withe finished result. The finished object is a perfectly squishy garter shawl that is long enough and skinny enough to be a lovely winter accessory. Seeing as it’s above 95 here in Kansas right now, I didn’t take any modeled shots. I just could bring myself to sweat that much! Above is the right side of the garter. And below is the wrong side. I think they both are aesthetically pleasing! I hope this means that no matter how I wear this one that it will be totally gorgeous. Happy Knitting!! My True Blue Fingerless Gloves were well on their way last we spoke. Well some decent toddler bedtimes this week led to some more progress. 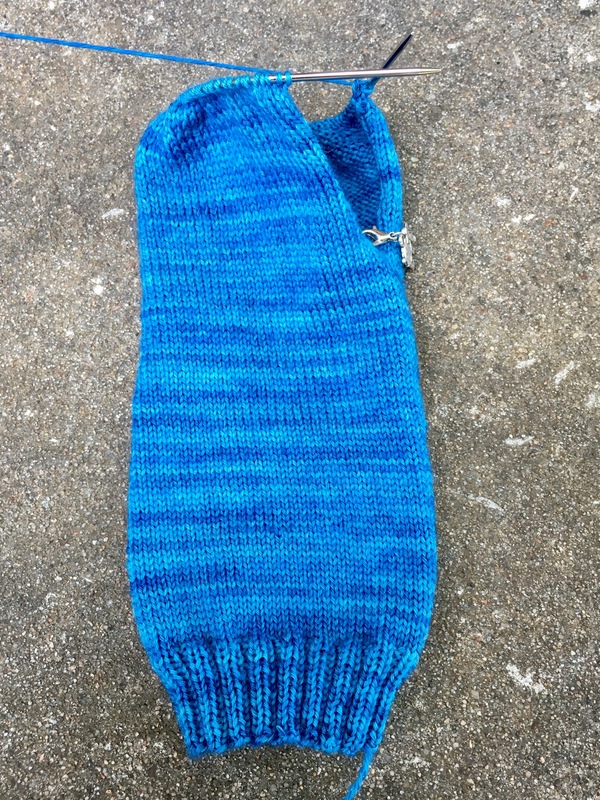 The first mitt is done! I was able to rejoin in the round after my thumb opening was big enough. After that I zoomed up the hand and finished with more 2×2 ribbing! After I finished the ribbing I knew I wanted to secure the thumb hole a bit more. So I got a teeny tiny crochet hook and SC around the opening. I had enough yarn left over to do three rounds. It really helped to stabilize the hole and create a more polished opening. The actual crochet part was terrible as the yarn was very splity with the teeny tiny and pointy crochet hook. But I survived. I am over the moon with this mitt. The fit is amazing and the finished size right on the nose for what I wanted. I am already started on the second mitt! Now, I realize that not having another all day conference right away that I may not finish the second as fast as the first. But watch me try…. The PALKAL or Podcast Along Knit Along hosted by Michelle of the Actually Knitting podcast was in full swing this summer. I didn’t play along as my knitting mojo was more geared to working on non-podcast related things. But I sure did take advantage of some of the coupon codes. 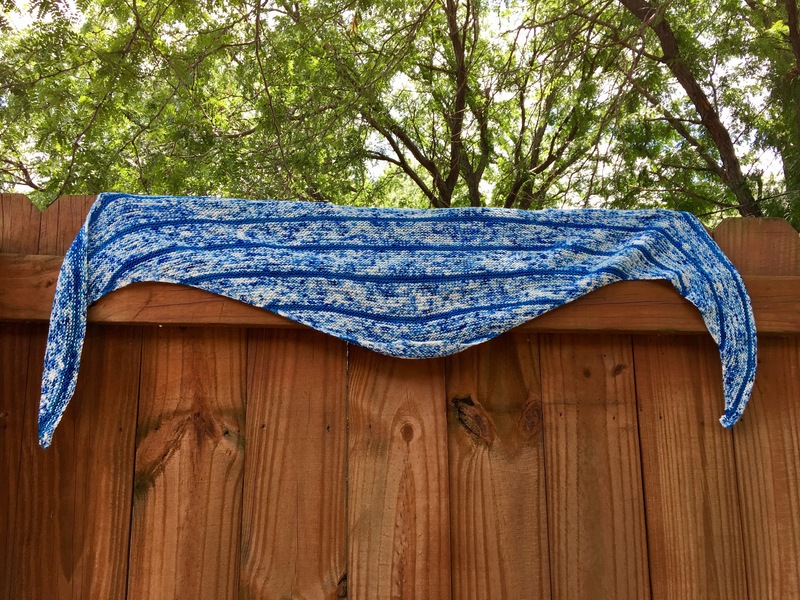 When Susie White of the Prairie Girls Knit and Spin podcast released her latest pattern I jumped on it and used her PALKAL coupon code. These top down socks feature a slipped stitch style panel down the leg and foot and utilize an afterthought heel. I don’t usually do top down because I hate turning a heel and having holes. I just haven’t gotten my brain to work that way yet. So this seemed to right up my alley. 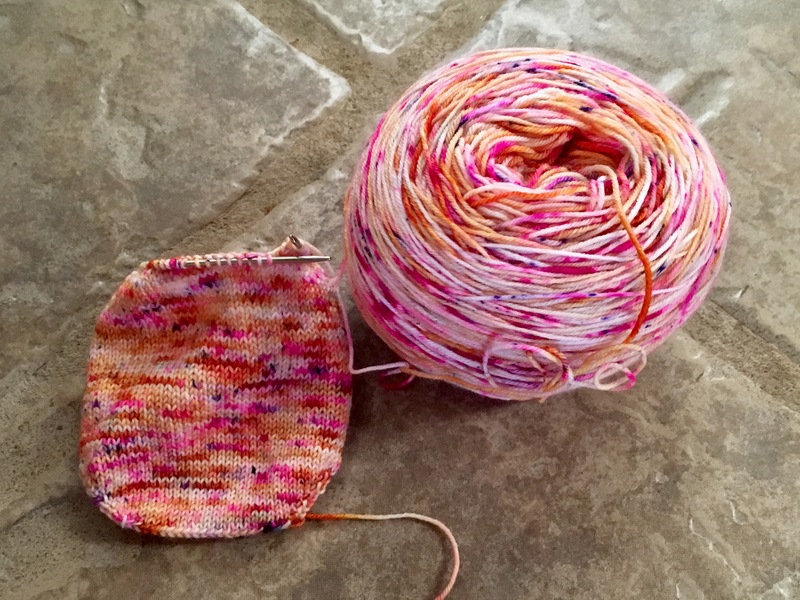 Now I know, awhile ago I started Susie’s ZigZagular Socks back in early 2016. I still have the toe of the first sock hibernating in my box downstairs in the craft room. I just couldn’t deal with the cable and counting and being interrupted by a toddler. 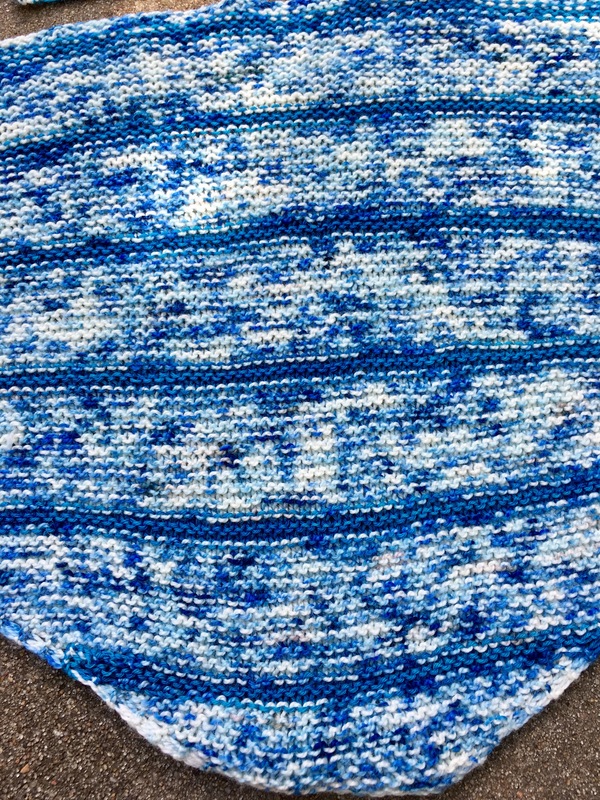 It’s an amazing pattern and yarn combo I will get back to some day…I swear. I recently had the opportunity to attend a conference in Kansas City that was centered on empowering women who work in public administration. I am even luckier that I work for an organization that values sending employees to this kind of conference. Of course I needed to take knitting how else was I going to spend 10 hours in a ballroom listening to presenters. But I didn’t have any simple round and round stockinette projects on the go. And then my mind drifted to the project bag from my Terribly Simple shawl that I just finished blocking. For Mother’s day I picked up a skein of Hansen Hand Dyes Mega Merino. That whopper of a skein had 820 yards of yarn in it. And despite working it into my Nangou and Terribly Simple I still have a TON of yarn left. 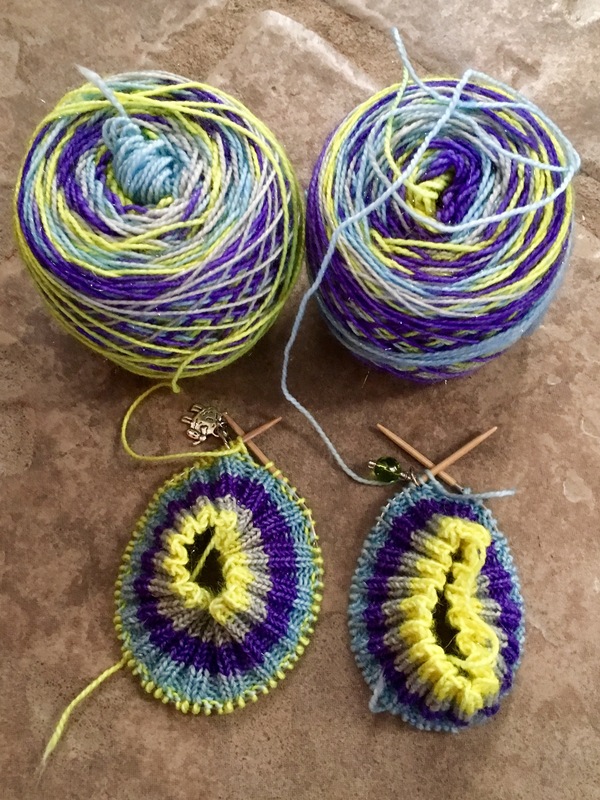 And a light bulb went off….I could make finger-less mitts to match both shawls! I grabbed some size zero needles and threw the yarn into a bag and off to the conference I went. I cast on 72 stitches in the round and just made the rest up as I went! 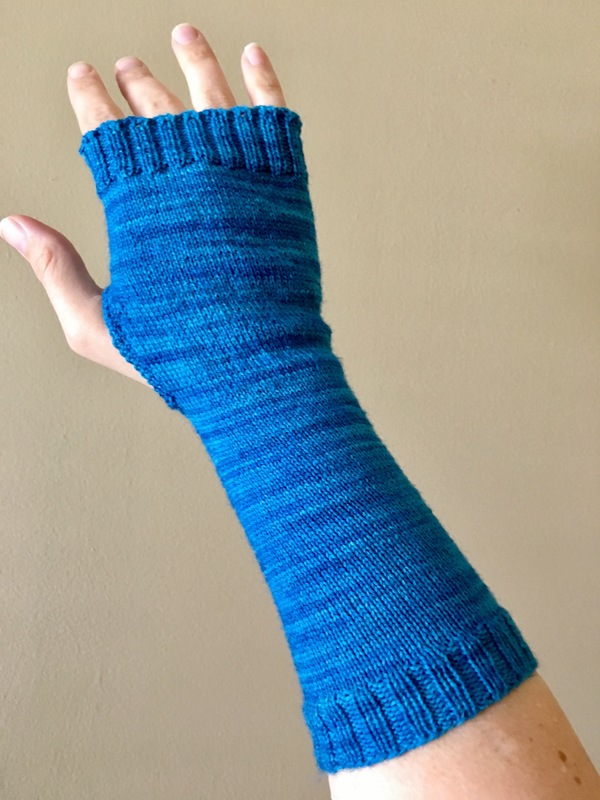 I was able to complete the cast on, 2×2 ribbing and all of the stockinette arm portion as the conference. And then thanks to Daddy doing bedtime that night I was able to complete the thumb hole split. I plan for these to be some long mitts! As you can see above I simply got to a point where I thought it was long enough and stopped knitting in the round and went to knit/purling back and forth. I am going to do this until it roughly matches the height from the bottom of my thumb joint to the web where my thump joins my hand and then I will hop back in the round!